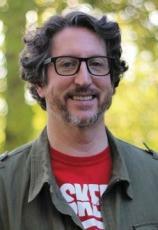 Paul Tremblay has won the Bram Stoker, British Fantasy, and Massachusetts Book Awards, and is the author of THE CABIN AT THE END OF THE WORLD, DISAPPEARANCE AT DEVIL'S ROCK, A HEAD FULL OF GHOSTS and the crime novels THE LITTLE SLEEP and NO SLEEP TILL WONDERLAND. He is currently a member of the board of directors of the Shirley Jackson Awards, and his essays and short fiction have appeared in the Los Angeles Times, Entertainment Weekly online, and numerous year’s-best anthologies. He has a master’s degree in mathematics and lives outside Boston with his wife and two children. Seven-year-old Wen and her parents, Eric and Andrew, are vacationing at a remote cabin on a quiet New Hampshire lake. One afternoon, a stranger unexpectedly appears in the driveway. Leonard is the largest man Wen has ever seen, but he is young and friendly, and wins her over almost instantly. Leonard and Wen talk and play until Leonard abruptly apologizes and tells Wen, "None of what’s going to happen is your fault." Three more strangers then arrive at the cabin carrying unidentifiable, menacing objects. As Wen sprints inside to warn her parents, Leonard calls out: "Your dads won’t want to let us in, Wen. But they have to. We need your help to save the world." Elizabeth Sanderson receives the devastating news that her 13-year-old son, Tommy, has vanished without a trace. Josh and Luis, the friends who were the last to see Tommy before he disappeared, may not be telling the whole truth about that night in Borderland State Park, when they were supposedly hanging out at a landmark the local teens have renamed Devil’s Rock. Living in an all-too-real nightmare, Elizabeth is wholly unprepared for the strange series of events that follow. As the search grows more desperate, and the implications of what happened become more haunting and sinister, no one is prepared for the shocking truth about that night and Tommy’s disappearance at Devil’s Rock. The lives of the Barretts are torn apart when 14-year-old Marjorie begins to display signs of acute schizophrenia. As their stable home devolves into a house of horrors, they turn to a local Catholic priest for help. Father Wanderly suggests an exorcism and contacts a production company that is eager to document the Barretts’ plight, resulting in what would become a hit reality TV show. Fifteen years later, a bestselling writer interviews Marjorie’s younger sister, Merry, at which point long-buried secrets and painful memories that clash with what was broadcast begin to surface.